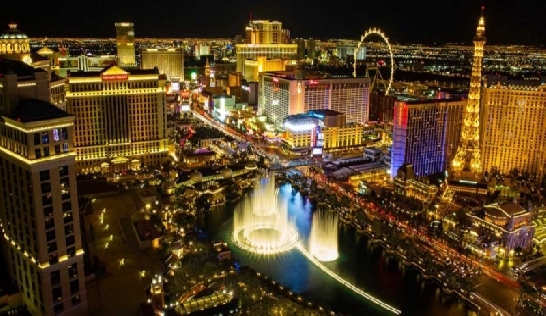 Las Vegas draws some 40 million visitors annually, including millions of conventioneers filling its 150,000 hotel rooms. The vast majority of visitors stay somewhere along the 4.2 mile Strip, which runs from Sahara Ave. to Russell Rd. Running in Las Vegas is a study in contrasts. The ‘Strip’ is certainly one of the more unique runs in the world, but if you can rent a car and get just outside the city, there are some great running destinations. 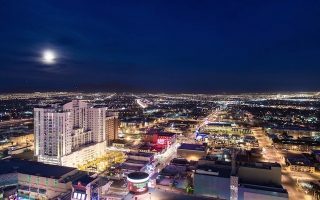 Running on the Strip is a unique experience, and with all those lights, can be done at any time. It can also be a challenge, given the crowds, the heat, and the fact that there are spots where one must go up stairs and through a mall/casino just to cross the street. 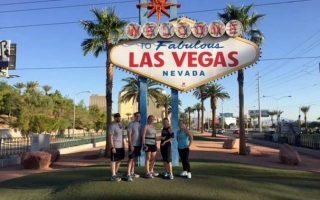 Our guide has lots of details on the best ways to run the Strip, with various distances. The best section from the main hotels such as the Venetian is to head north. 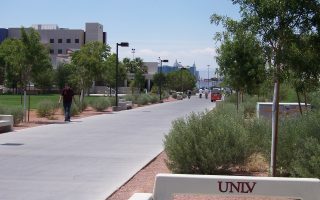 For access to more run-able downtown and some residential areas, stay at the southern end of the Strip so you can access E. Harmon Ave and the UNLV campus, or downtown. Most, but not all, side roads off the Strip have sidewalks and are run-able, though they’re a bit of a concrete jungle. Once outside the city, your running options multiply and are really interesting. Sunset Park is an oasis near the airport, with 3+ miles of trails. 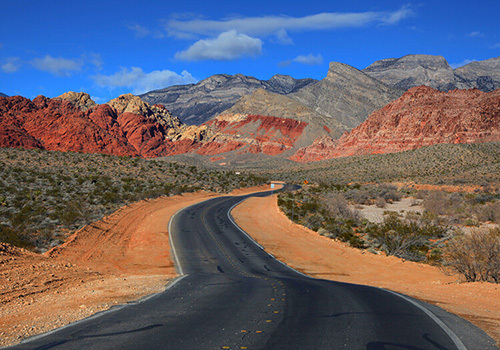 Red Rock Canyon is 20 minutes away and is spectacular. 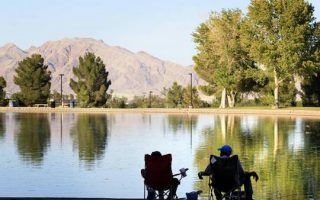 There is also good running in the Las Vegas suburb of Henderson, especially The Clark County Wetlands, 3+ miles of desert-y nature trails and a 14-mile loop trail, and the nearby River Mountains Loop Trail, which has some spectacular sections though canyons, with views of Lake Mead. 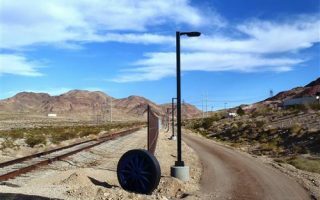 The Historic Railroad Tunnel Trail, connecting Lake Mead and Hoover Dam, is an iconic run and less than an hour away. 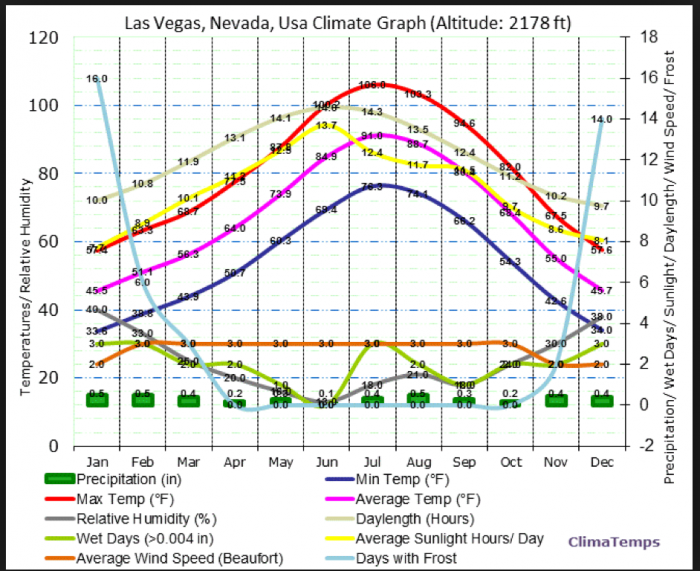 Topgraphically, Las Vegas is flat but there are some great hills and canyons for challenging trail running within 10–20 miles of the city. And as for the weather, this is the desert. Temps from May-September exceed 100 degrees almost daily. Please use caution — go early, use sunscreen, and hydrate, folks! Winters are more moderate and nights/early mornings can be cool. Might not be beautiful, but a one-of-a-kind run. 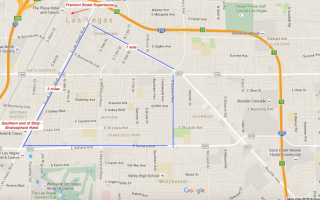 Our guide to running the strip and side streets. Go early! The best option near the Strip. Decent side road up to the Univ. of Las Vegas Campus. Downtown Las Vegas is more run-able than the Strip. While not exactly bucolic, running downtown gives a sense of the “Old Las Vegas”. The best option for running off of The Strip and Main St. is the residential neighborhood accessible from the southern end of the Strip. A 300 acre green oasis only a couple of miles from the airport. There's a 9-acre lake, and 3.5 miles of trails. Also playgrounds, picnic areas, and opportunities for multiple types of recreational activity. See park map for trail details. 2,900-acre park 20 mins. from the Strip with many miles of trails through wetlands & desert vegetation, with views to the mountains. 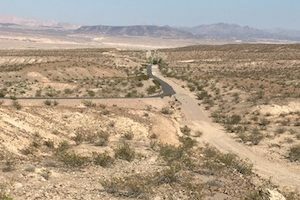 3+ miles of paved trails in the 'Nature Preserve', and a 14-mile Wetlands Loop Trail along the Las Vegas Wash.
Paved, hilly 34-mile trail in the Las Vegas Valley surrounding the River Mountains, connecting Lake Mead National Recreation Area, Hoover Dam, Henderson, and Boulder City. Our favorite section is the northern 14 miles heading east, downhill with great views of Lake Meade. This suburban rail trail runs along alongside an active railroad, separated by a fence. The northern terminus is Acacia Park in Henderson, 15 miles southeast of Las Vegas. A great way to experience running in the Mojave Desert, only 17 miles from the Strip. 30 miles of trails, dirt roads, (many of them run-able), and a 13-mile Scenic Drive loop. A spectacular 3.5 mile gravel trail between the Lake Meade Visitor Center and Hoover Dam. About a 45 min. drive from Las Vegas. Great views and several tunnels. Mt. 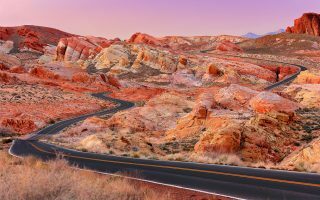 Charleston and Valley of Fire State Park both are worthy destinations for running if you have the time…and a car. Most of the signature hotels in Las Vegas are located on the Strip. The most elaborate ones, such as the Bellagio and the Wynn, are toward the southern end of the Strip. If you are determined to run in Las Vegas and want to avoid the Strip, try to stay at one of the hotels (Bally’s, Aria on the Strip, Hard Rock Hotel, Alexis Park on E. Harmon Ave.) near E. Harmon Ave., which is decent for running and takes you over to the UNLV campus. Another option, if you don’t need to be right in Las Vegas, is to stay at the Red Rock Casino Hotel, 17 miles away. 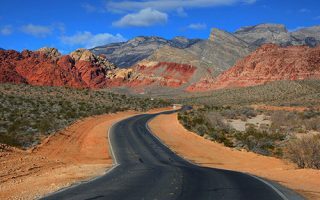 They have great rooms, restaurants, a nice pool and fitness center, and are within a few minutes of Red Rock Canyon (car required). Among the Strip hotels, the ones with the best fitness centers are: Bellagio, Wynn, Mandalay Bay, Aria. 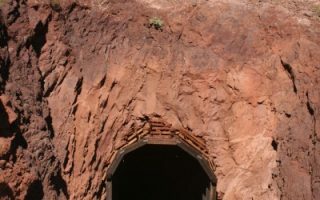 There’s also a Canyon Ranch at the Palazzo hotel. Most of these hotels charge a (mandatory) resort fee. 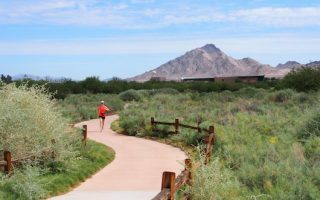 Near Henderson and Hoover Dam, there’s a great Westin resort with excellent fitness facilities and proximity to fabulous running opportunities. On the Strip, there are outlets of some of the major chains such as Nike and Puma. Red Rock Running Company is the main running store game in town, with suburban locations in Summerlin (Red Rock), Henderson, and Cheyenne. Las Vegas South Premium Outlets. Just south of airport. Nike & New Balance Factory Stores. Summerlin/Red Rock Area: Red Rock Running Company. Group Runs: Thursdays 6pm from store. Henderson Area: Red Rock Running Company. Group Runs: Tuesday 5:30am, Wednesday 6pm, Saturdays 6:30am (more experienced runner) from store. 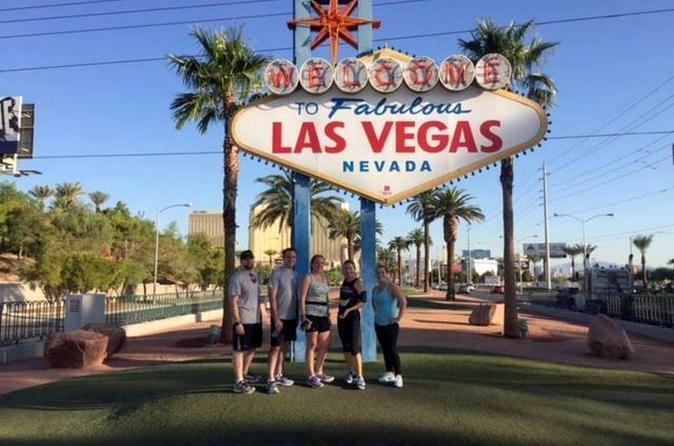 Las Vegas Runners is the major running group in the area. Very active group with meetup page. There is a very active running scene in Las Vegas with multiple events every week. Event Calendar.